electro-music.com :: View topic - Archer Video Enhancer Schematic! Posted: Thu Sep 13, 2012 2:45 pm Post subject: Archer Video Enhancer Schematic! Subject description: Copied from the Archer Video Enhancer/Audio Mixer device. So I traced out a schematic from an old Archer Video Enhancer/Audio Mixer device. The original device is shown below, followed by the schematic. I kept the schematic original, didn't add any modifications; although I did change q1 and q3 to 2n5088 and q2 to 2n5087 over the original C945 and A733. 2n3904 and 2n3906 would likely work as well. Some interesting modifications would be to change the biasing resistors for q1 and q2 and maybe R7. I have not done any mods to this circuit, nor have I built it yet. I have simply traced it from the PCB. The circuit itself is a bit like a sharpener and contrast rolled into one. When you bring VR1 down past 10% or so, you start to lose sync which is a result of the unsophisticated circuit design. VR1 is a voltage divider/level control for the whole signal path, and there is no clamping circuitry for the sync, so everything, including sync, is attenuated by VR1. An odd artifact of this circuit is when you bring VR1 down, you start to filter out everything except blue, not sure why. I personally rather like this circuit, despite how unsophisticated it is. It will directly process composite, with the notes above. Just like any enhancer of this sort, you will get a lot more apparent noise when you 'enhance' the signal. 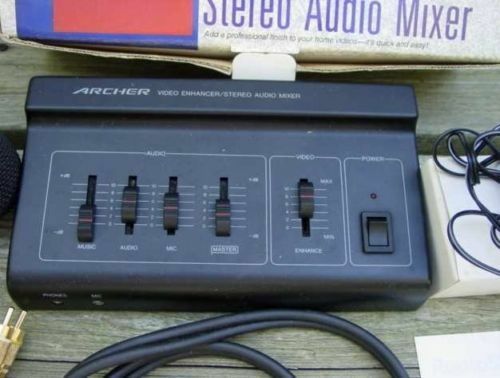 Original Archer Video Enhancer/Audio Mixer. Archer Video Enhancer schematic. Missing the value for VR1 and R11. I finally got through a long to-build list and built this thing. I didn't use exactly the same values as on the schematic, and used 2N3904 and 2N3906 because that's what I had to hand. For VR, I used a 5K. 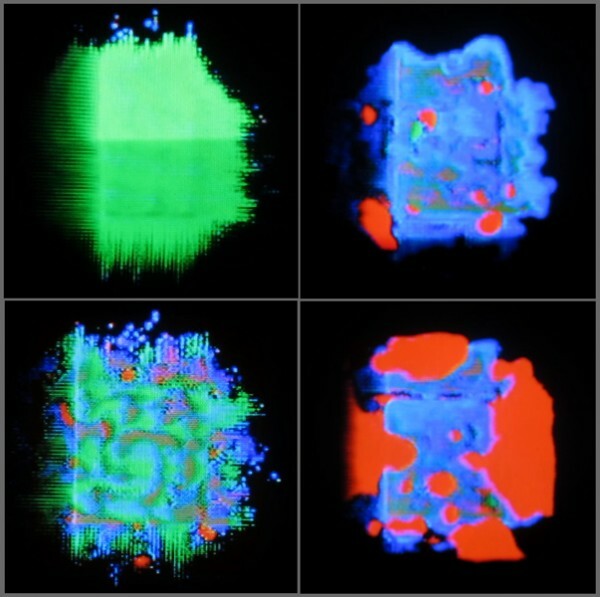 Toward the high end of VR, I get more cyan in the image, and toward the lower end, more red, until finally one loses sync. For R11 I used 47 ohm, and it seems that going above 1K, the sync is lost. Changing C4 affects the image a bit, but I can't qualify exactly how. Going above 1 uF doesn't seem to change much (I even went to 1000 uF). That's about all I played with so far. Aside from some sort of color shift when approaching the lose-sync position of the pot, it's not all that exciting. But then I starting doing video feedback, and produced some kinda freaky cool stuff! Here are some stills... camera pointed at TV, its signal going through the circuit, which goes into the TV. Shot with another camera off the TV. yeah, i finally actually built this as well... about a 2 or 3 weeks ago. i too used 3904 and 3906. I changed the value of c1 to 47nF, which would enhance more frequencies. I find that effect better though. I put a trim pot between the pot and ground, so that i could trim it just above the point where it loses sync. i built this circuit and a video amp with crude brightness and contrast controls, and black level. i added vactrols for voltage control of most of the parameters, and inside the box is an LFO and an envelope follower for external music control. ringmad, you are right, it is great with feedback. that is what i had in mind with this from the start.